puts your business ahead of the competition. Atwill Media works hard to ensure that your construction business stands out from others in the industry. Our team of professionals makes sure that each page of your website is customized to showcase the services you provide and your hard earned skills. Don't sweat it! Let our team give you the tools necessary to create a digital footprint for your business. Website Examples | Click on the images below to see full website. Groundbreaking features bring in permanent business. 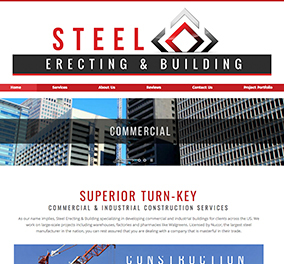 We understand that construction businesses offer a variety of services and that's what our powerful website features bring to the forefront. They are intricately designed to fully showcase what your company specializes in so that it is easily communicated to existing and potential clients. Our websites give people access to the information they're looking for when they most need it. Construction and remodeling projects are a big deal and can be costly, so trust in the construction business is key for the customer. 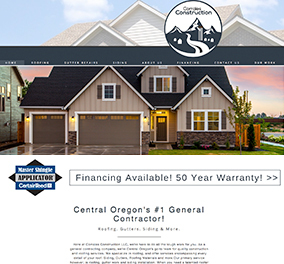 A good About Us page on your construction website can help foster trust and let the customer get to know you and your business. An up-to-date calendar on your website can help keep both subcontractors and clients informed of upcoming construction projects and times you will be busy. Forms for your construction website can be customized for any purpose. Whether you want a form customized for government entities to contact your business or you want a more streamlined communication method between subcontractors, custom forms will do the trick. Testimonials can play a strong role in somebody's decision to use your construction business over a competitor's. 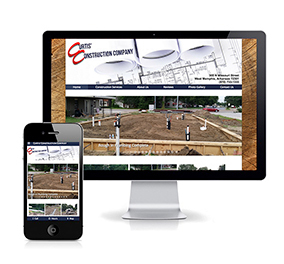 Showcase your testimonials from past customers on your construction website! Outlines clearly and efficiently what kind of construction and remodeling services you offer. Also helps with SEO by ensuring customers find your business when looking for specific construction services. We understand that there is a shortage of qualified, skilled labor in the construction industry. This form can help to increase leads for your business to vet qualified employees that may be interested in working for your construction business. Make potential customers' lives easier with this on-site calculator for estimating the cost of a construction project. Just give us the details for the information you want included in the estimation, and we can customize the calculator to your specifications. Showcases your knowledge of the construction industry, answers customer questions quickly, and naturally aids SEO efforts. Helps ensure the website will show up in the correct service areas when customers search online for construction or remodeling services in the area. Lets customers conveniently pay online for your construction services and remodeling services. Upload photos to your website! Showcase before and after photos of construction and remodeling jobs you've previously done to give potential customers a good idea of what your construction business can do for them. Customers can call with one click from your Atwill Media website to contact you for construction or remodeling services. We know not all construction jobs are worth the same value and that pricing varies from job-to-job, so customers can request a pricing quote for a new construction or remodeling service for their home or business via this form. Costumers can submit a request to your business construction or remodeling services via this form without needing to place a phone call. Have a limited-time offer or a special deal on your construction services that you're wanting to promote? Advertise specials, promotions, sales, etc. on your website. that elevates the marketing efforts of your business. Atwill Media believes that trust plays a big role when establishing or expanding a business. We understand how the industry of construction can be competitive, but with the knowledge of our team of experts, we're able to distance you from the rest. With strong website features built to lay a solid foundation for your business to help you escalate on the marketing ladder, you are set for success! This is how Atwill Media brings your vision to life! The first step in Atwill Media's process when creating your website is obvious: YOU! One of our highly trained experts will set up a time to interview you so that we are able to fully understand your wants, needs, and expectations for your website. We will work with you and keep you involved every step of the way to ensure your satisfaction with the finished product. I want a construction website! Need help with your company's social media? Click LEARN MORE to see how we can help!